To encourage dialogue and joint efforts for promoting shared values of freedom, justice, democracy, tolerance and respect for human rights. These goals will be accomplished though formulating and disseminating policy recommendations through research projects, training sessions, conferences, seminars workshops, focus groups and publications. CIPP will encourage the participation of scholars, leaders of opinion, policy makers and media personnel in all of its activities. The people who initiated CIPP – Dr. Sulayman Nyang, Dr. Mumtaz Ahmad and Dr. Zahid Bukhari — also collaborated previously for Project MAPS: Muslims in American Public Square, and American Muslim Study Program (AMSP) at Georgetown University’s Prince Alwaleed Center for Muslim Christian Understanding from 1999-2010. CIPP, in a way, is a continuation of the team’s previous engagement with the issues pertaining to the role of Muslims in American public square and their participation in critical debates on Islam in the West and the issues of governance and development in Muslim societies. Dr. Sulayman Nyang, President CIPP, teaches at Howard University in Washington, D.C. where he serves as Professor of African Studies. From 1975 to 1978 he served as Deputy Ambassador and Head of Chancery of the Gambia Embassy in Jeddah, Saudi Arabia. Following his diplomatic stint, he immigrated to the United States and returned to academic life at Howard University where he later assumed the position of department chair from 1986 to 1993. He also serves as co-director of Project MAPS: Muslims in the American Public Square, a research project funded by The Pew Charitable Trusts. 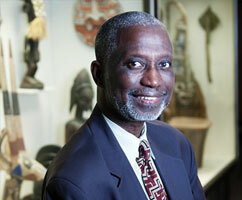 Professor Nyang has served as consultant to several national and international agencies. He has served on the boards of the African Studies Association, the American Council for the Study of Islamic Societies and the Association of Muslim Social Scientists. Dr. Nyang is listed on the editorial boards of several national and international scholarly journals. He has lectured on college campuses in Africa, Asia, Europe and the Americas. Dr. Nyang has written extensively on Islamic, African and Middle Eastern affairs. His best known works are Islam, Christianity and African Identity (1984), A Line in the Sand: Saudi Arabia’s Role in the Gulf War (1995) co-authored with Evan Heindricks, and Religious Plurality in Africa co-edited with Jacob Olupona. His last book was Islam in the United States of America (1999). Professor Nyang has also contributed over a dozen chapters in books edited by colleagues writing on Islamic, African and Middle Eastern subjects. His numerous scholarly pieces have appeared in African, American, European and Asian journals. 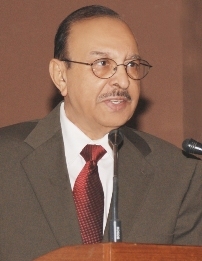 Dr. Mumtaz Ahmad is Executive Director of Iqbal International Institute for Research & Dialogue, at the International Islamic University (IIU), Islamabad since 2007. He previously served as Vice President (Academic Affairs) and President of IIU, Islamabad during 2008-2014. He was a Professor of Political Science at Hampton University, VA, USA from 1990 to 2007. He received an M.A in Political Science from Karachi University, an M.A. in Development Administration from the American University of Beirut, and Ph.D in Political Science from the University of Chicago. He has served as: member of “Islam and Social Change Project” of the University of Chicago; Research Fellow at the Brookings Institution, Washington, D.C; Senior Fulbright Fellow in Bangladesh and Pakistan; Fellow of the United States Institute of Peace (USIP) in Sudan, Pakistan and Malaysia; American Institute of Bangladesh Studies Fellow; American Institute of Pakistan Studies Fellow; member of the “Fundamentalism Project” of the American Academy of Arts and Sciences/University of Chicago; and Senior Consultant for the “Muslims in American Public Square” Project of Georgetown University. 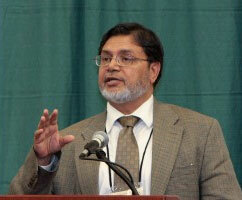 He is currently President of the South Asian Muslim Studies Association (SAMSA), an affiliate of the Association of Asian Studies (AAS) and Vice-President of Centre for Islam and Public Policy (CIPP), Washington, D.C.
Dr. Zahid H. Bukhari serves as Executive Director of the Center for Islam and Public Policy (CIPP), Washington, DC. Previously, he worked as Director, American Muslim Studies Program (AMSP) at the Prince Alwaleed Center for Muslim-Christian Understanding, Georgetown University, Washington, DC. From 1999-2004, he also worked as Director, Project MAPS: Muslims in American Public Square, which examined the role and contribution of the Muslim community to the American public life. Dr. Bukhari’s research interests focused on Islam in the West; Muslims in America; religion and politics; and religion, humanitarian aid and development. He is also editor of the Project MAPS volume: Muslims’ Place in the American Public Square: Fears, Hopes and Aspirations; and the CIPP volume: Observing the Observer: The State of Islamic Studies in American Universities. Dr. Bukhari has a Masters in Economics from the University of Karachi, Pakistan and Ph.D. in Political Science from the University of Connecticut, USA.